Did nearly nothing today. Patricia made turkey soup, and it was delicious. We watched "Girls Trip" and "Spider-Man: Homecoming" this evening. It is now past midnight. In the coming hours, we will have to get up and prepare for our friend Rhea Mahar's funeral service. I don't know what to expect other than plenty of tears. Her sudden and tragic death has kept me thinking about the fragility of life and the inevitability of death. I guess it's about trying to pack as many positive things into that life as you can. Oh, here is the link to her obituary. That's the theory, but plenty of people have lousy, stinking jobs and/or poor education and poorer prospects. It is hard to state that their lives are of good quality, but who am I to judge? I think I will turn in. Need some sleep and need to think about Saturday's service. 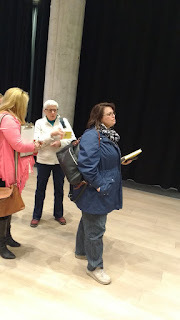 I got up early, around 6:30, during my brief vacation, so I could drive to the Nova Scotia Archives and research an unsolved murder. I got there at 8, even though they don't open until 8:30, and I am glad I did, because I took the last of the three free parking spaces. I was told by the woman ahead of me that the lobby opens at 8, and those spaces are highly coveted. I got lucky. I remained there from 8:30 until nearly 2pm. A couple pee breaks, and a ten minute Kind Bar and water break, but otherwise I was hard at it. I found quite a bit of material for this case, including the person's obituary, which has a wealth of information. I was just now trying to find this person's relatives in Facebook, but did not have much luck. I will try again in the morning. I got back home around 2:30. Patricia and I watched the final two episodes of "Longmire" on Netflix. My goodness, that was an entertaining program. As some of the cast said, the final season was like a 10 hour movie. I do hope that they bring back the character in some form, and not too long from now. I am curious to try out the Longmire novels by Craig Johnson. I have never seen one anywhere, so I may have a hard time finding them. I have had a long day. Researching unsolved murders can take a lot out of a person. I have taken a few days off of writing. I have sat around doing precious darn little the last few days. Christmas came and went. If not for Patricia, I would likely not bother with it, but I have to admit, it was nice to look over at the tree the last few days. Patricia picked out a lovely one, and she did a great job decorating it. I feel like a jerk for not doing more to make the tree look purty, but I was cleaning up around the house while she was making the tree look nice. I wasn't at all sure what to get Patricia for the holidays. She had dropped enough hints about one thing that I would have had to be even dumber than I normally think I am to have missed them. So I got her the "five visit" card to Hands on Halifax, so she can practice using power tools. I had already bought her a Halifax-based cat calendar, so I taped that card in the January page. I bought her a couple other gift cards and stuffed them in the calendar to keep everything in one place. Before I knew it, I had four of five gift cards there. Then, it dawned on me. A calendar has... 12 months in it, right? Why don't I... buy a total of 12 gift cards and tape them inside this calendar? The following weeks, usually on pay days, or when I got a cheque from my Frank work, I would go buy several cards. As recently as this past Friday, when we went to the Halifax Shopping Centre, when Patricia went off to get something for me at a store, I dashed into the David's Tea outlet and got her a gift card. I was gonna get her a gift card at the Starbucks, but there wasn't time. I noticed there was a Second Cup coffee place across from the David's Tea, so I went there and got her a gift card. I was emerging from the store as Patricia was returning to where she had left me 10 minutes earlier. I nonchalantly approached her and we went off to have lunch in the food court, her none the wiser. I taped each of the 12 gift cards in the calendar, and wrapped the whole thing, and presented it to her on Christmas morn. She was quite pleased. She got me a bottle of rum from a Halifax distillery, a small bottle of Kraken rum, a portable hard drive that will soon be added to my media server. It is a 5TB drive, so it should last me until a week from Friday before it is full. 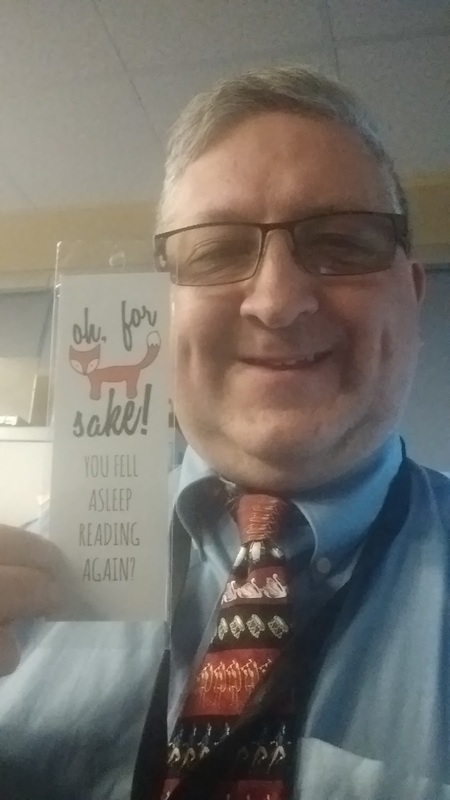 She got me a lanyard, which I will probably use for my archive visits. It has Deadpool on it. She got me a Subway giftcard. Some undergarments. A couple Michael Connolly novels. Some stuff I use after I shave. Some stuff you add to yogourt and sour cream to make flavoured dip. We spent the rest of the day watching tv and eating. We were lucky. The power flickered a couple of times, and the power went out for maybe 20 seconds, but we were not among the 150 000 customers who lost power, and had to throw out their turkeys. Felt perhaps a bit guilty. Boxing Day, we slept in. That did not keep me from taking a long nap in the afternoon. We spent a few hours last night watching the final season of "Longmire". This evening, we watched through episode eight, of ten. We will really miss the show a lot. Today, we stayed in. Too cold to go out to brave the Boxing Week sales, and we don't want to spend the money, anyway. Tomorrow, I have some plans for the morning. I will tell you about them tomorrow night. So, Christmas is over. I have heard repeatedly, mostly from cash-strapped parents, that the holiday is for kids. I have no children. "Just" a family of Patricia and Newbie and yours truly. The holidays have meant much, much less to me since I lost my parents. I wanted to buy them decent prezzies every year as a way to return the favour to them for all the sacrifices they made for us when we were growing up. Now that they are gone, and I am estranged from my siblings, the holidays mostly mean a few days off work, some decent food, and lots of rest. Better than nothing, but nothing like what the days once meant to me. In the coming weeks, I will be making some changes in my life that I think are for the better. These are decisions that I have been postponing for too long, It is foolhardy to hold on to the past for the sake of the present, or the future. I will share those decisions with you once they have been made, and once the irrevocable consequences of those decisions are set in motion. I need to get up early tomorrow morning. Yes! I know! I'm on vacation and getting up early. Shame on me. Patricia is upstairs contending with the turkey. We bought it on Friday afternoon in Wolfville for a good price at that sort-of independent grocery store that always has good deals. It was fresh, too. We stored it in a Costco thermal bag since then, and I threw some ice packs in with it on Saturday. This evening, some of those ice packs were still frozen, and the turkey was very cold. The last couple of days have been restful. Saturday morning I checked out the new convenience store in Lakeside. Since the Sobeys sold it, the new owners have really made it their own. They have an actual bakery there, and at least two full-time bakers who get up at the crack of dark and prepare delicious baked goods. We got some shortbread cookies and some assorted baked goods and banana bread and cinnamon rolls. Beyond excellent. I also got some brekky at the McDonald's in Bayer's Lake. That's as far as I have gone. We watched Christmas Vacation on Plex last evening. The movie is easily the best of all the vacation movies, but that is not saying a lot. I have heard so many bad things about Chevy Chase over the years that I can't help but wonder if I can see some signs of his unniceness in his onscreen performances. I have not. He hides it well. Today, I slept in and except for a quick trip to deliver a gift card to the young man who clears my driveway and mows my lawn, I have remained in my jammies all day. I may do that tomorrow, as well. Maybe even the day after. Depends. I will write about the holidays tomorrow, and maybe even Tuesday. I have some thoughts I want to share with you. And, this year's extravaganza draws to a close. We worked this morning. 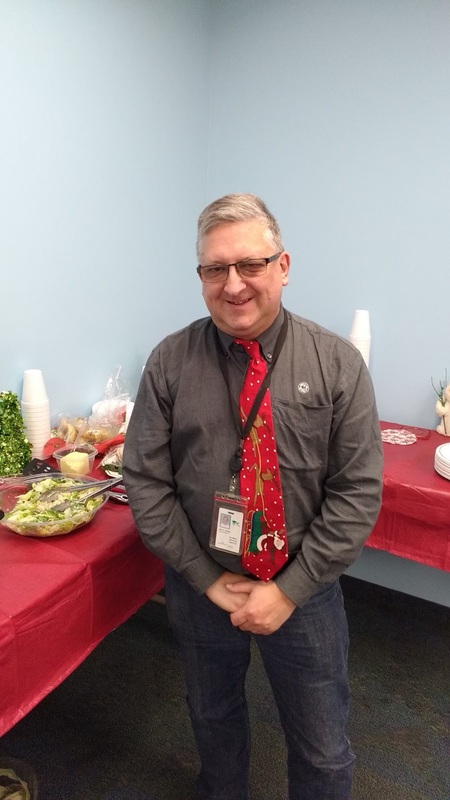 Then, at lunch time, when government shut down for the holidays, we hopped in the Soul and grabbed some lunch at the Halifax Shopping Centre. On the busiest shopping day in the year. After that, we walked around the mall and noticed how much the place had changed since the major reno's. We drove to Wuffle. Went into the Larche store where Patricia got a cutting board that she wants to incorporate into a portable butcher's block type thingy she wants to build after the holidays. Got some food at the IGA-type store there. Then we went to the Just US! 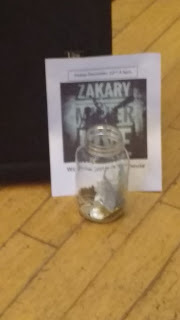 coffee shop just in time to catch Zakary Miller, a talented local musician who focuses on folky, roots-based music. Never heard of the guy before, but now I am a fan. 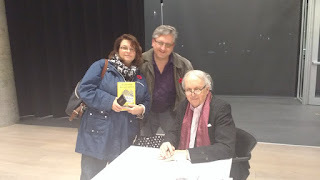 And he was kind enough to pose for some pics with me. A very nice young man. If he comes to your town, please go see him. You won't regret it. We watched the news. Cindy Day has made her farewells on CTV. She repeated on air that she is remaining in town. The poorly-kept secret is that she will be going to CBC after the holidays. We returned to the city around 8:45. I cooked some scallops and we consumed them, and have decided we don't want them again for quite a while. They are not the kind of food that a person should eat very often. It is not just the cost. It is a rich food that does not reward frequent eating. We are still bummed about the death of our friend Rhea Mahar. We anticipate that her funeral will be between Christmas and New Year's. We plan to go. It is upset us both. 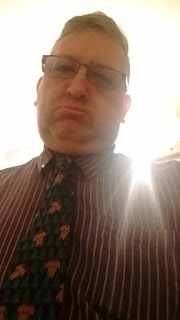 And, this brings to a close the 10th annual Bevboy's Christmas Tie Extravaganza. I have no idea whether I will do this again in 2018. 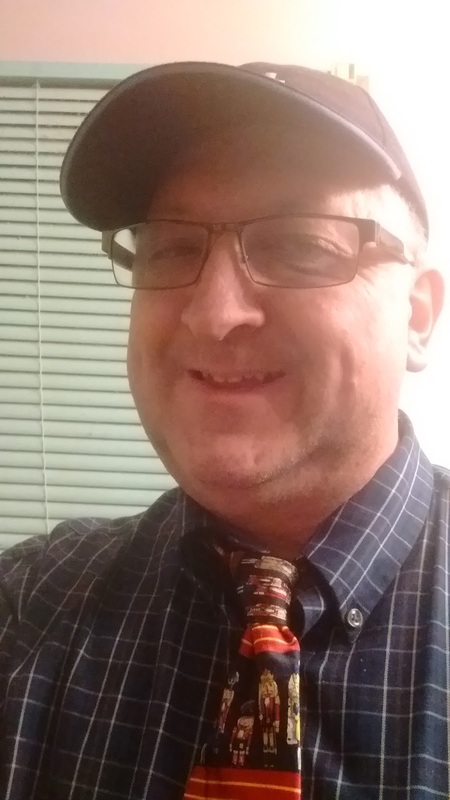 I keep saying I have no other places to get my picture taken with these ties, but every year I think of a few. We will play it by ear. I think I will turn in. Our vacation is here, and we need a rest! Not feeling it tonight, folks. I just learned that a good friend died in a car crash Tuesday night. Here is the link. Killed was Rhea Dawn Mahar, a neighbour of mine whom I met in 2004 when she joined my Toastmasters club. I didn't know she was a neighbor at the time. One of those kismet things. Over the years, we'd hang out. When Paticia was sick in the hospital in 2008, and it was touch and go for her, Rhea made sure to invite me over to their place for dinner and some fun, even though I felt guilty as hell about being away from Patricia's hospital bed. In 2014, I hired her and her crew to build me a new front and back deck. They did a great job. Rhea was funny. She loved nature and the outdoors. She loved her kids, and grandkids. I loved her laugh, and I loved her house, as it abutted on to a lake. And she was scrupulous about building things that were green. She would not use pressurized wood on my deck. It was up to me to make sure I stained it to protect the wood from the elements. So, every year, I spend perfectly good money to do this. Which is fine. I had hoped we would have many years together as friends. We are into the time of year when people get together who may not like each other too much. I am estranged from family members, myself, and cannot see my way clear to co-exist with them. We are told that we should forgive and forget, but that is not always possible, practical, legal, or sensible. But what is possible is to keep in touch with those who are important to us, and to tell them how important they are in our lives. We don't do that nearly often enough. It's a damn shame. We are only here for so long. I will really miss Rhea. I hope to be in a better mood on Friday. 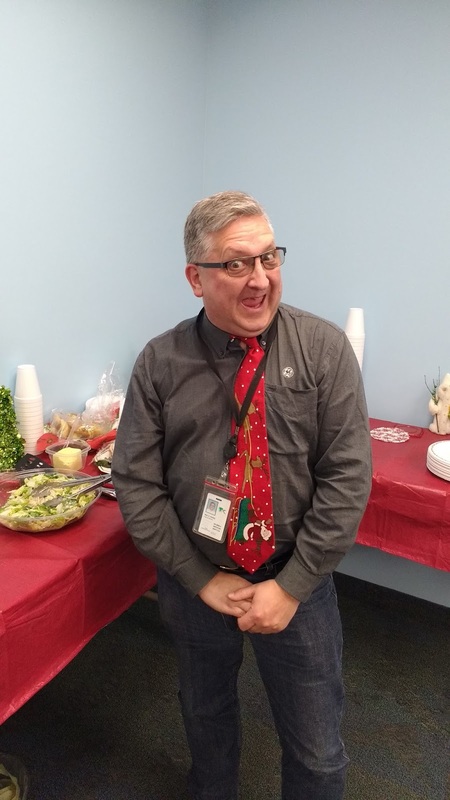 So, we have a holiday potluck lunch at work every year. It was today. I bought a family-sized Caesar salad and mixed it. Others brought some hot dishes. Sammiches. A nice punch. Plenty of sweets. And, of course, I had to pose in front of it, didn't I? Short and sweet, just like me. Not. A friend of mine, Mel Sampson, runs a company on the side where she makes these little bookmarks and other crafty, etsy-related things that, as a man, I cannot fully appreciate. She does it super well. Patricia bought me one of Mel's bookmarks for Christmas last year. Mel is afternoon drive at K-Rock in New Minas, as well as that station's program director. She is a busy lady. 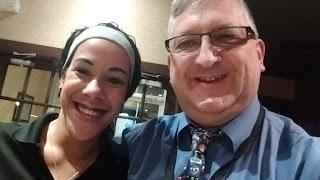 Here is a link to the article about her. And here is a sample of her work. Wow. Three blog posts in one day. How much will you pay now? What else do you do after being home, sick, for two days? Why, you return to work, of course! Patricia took me to breakfast at the Subway at the corner of Argyle and Blowers and we shared a foot long sub. I can quite easily consume a foot long sub on my own, but I was seriously off my feed after being sick, so this was like a buffet. Natalie was our server. 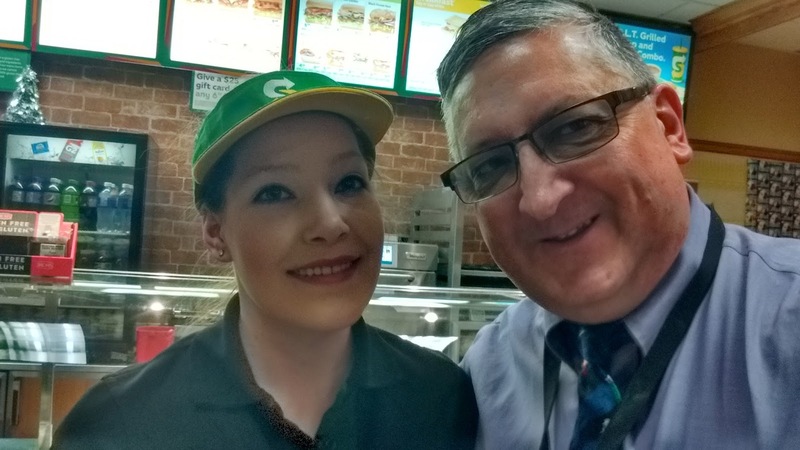 She is a very hard working and very sweet young lady who has prepared many a sub for us over the last year or so. She manages the place and gets up supremely early to open the place and get it ready for customers. I grumble and gripe about getting up at 5:30 or so during the week. I'm sure Natalie is up long before that, for a job that pays less than what I make. My hat is off to her. And now you know what she looks like, you blog readers in the U.S. and abroad. See you later today... maybe. Possible bonus Christmas Tie event may be in the offing. Here I am at work, probably on Tuesday afternoon. I am sick. My nose is runny. I am suppressing a sneeze. As I mentioned in an earlier post, I went through a couple of boxes of Kleenex that day. I sounded awful. I felt worse. So, I thought I would share those moments with you. Aren't you enjoying this blog post? Hi. Relatively early on Sunday morning. At least for a weekend, I am up early. I owe you an apology. I haven't written in several days, because I have been sick. I started feeling poorly Monday evening. All day at work I was coughing and sneezing and gobbing. I went through three boxes of Kleenex. 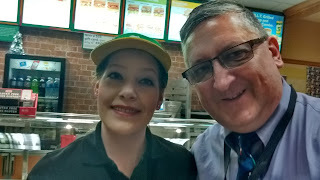 I got home, and while Patrica was having dinner with a friend (hi, Lynn! ), I was abed, mostly asleep. Wednesday, I took a sick day, which is an automatic day off for the blog, for reasons I have already spelled out. I slept nearly the entire day, rising only to eat something here and there. Thursday I began to feel human again, but took another sick day. Friday, I worked, but went to bed early. Saturday, Patricia had a class on how to use power tools, while I cooled my heels at the Archives. Afterward, we went to the Salvation Army thrift store on Strawberry Hill. (At times, their prices are not thrifty at all. They were trying to sell a couch there yesterday for $375). We checked out a newly-branded convenience store in Lakeside. Then, we returned home. Still recovering from this man cold, I was feeling tired and weak and achey, so I have been in my jammies since mid-afternoon. We spent the evening having a nice dinner and then watching some episodes of "Speechless", easily the best comedy on television, and one which critics don't appreciate nearly enough. I turned in early, and got up, and here I am. I have missed writing these blog posts. I will shortly be posting a couple Christmas tie posts, the one from Tuesday, and the one from Friday. There will not be a post from Monday because I am taking another day off work, this one scheduled in advance. Anyway, I'm back. And I am glad about it. More posts in a bit. Watch for them. Patricia had a night out at the Rebecca Cohn with her book club folks, so I took myself out to dinner. Here I am poised to eat some pasta. 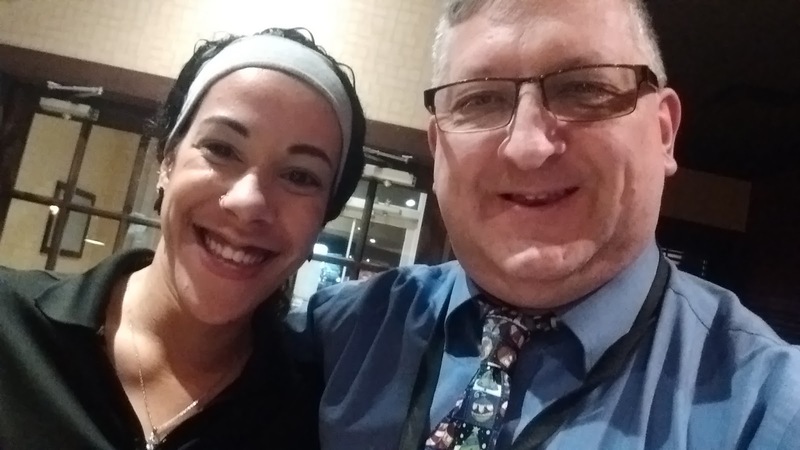 And here is my server, or one of them: Janelle, although I may be totally mangling the spelling of her name. My apologies, ma'am. I gave her a blog business card, so there is a decent chance she will see this. Day six already. 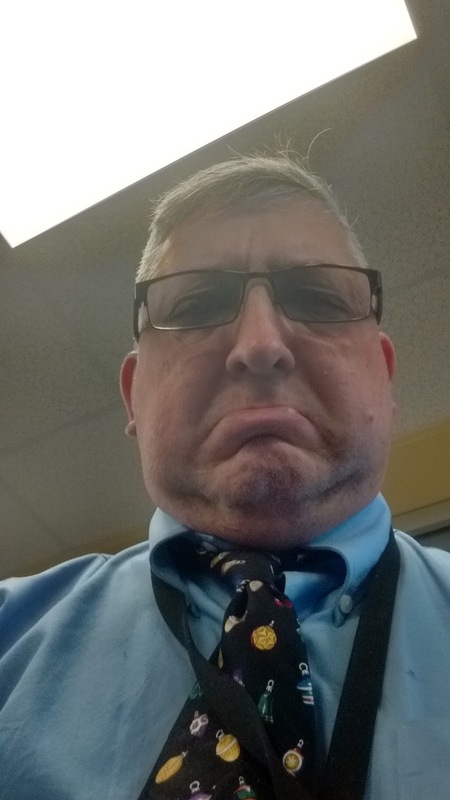 What do we do for day seven? Well, that was a fun weekend. We went to the Valley Saturday morning. Did some stuff around the house. 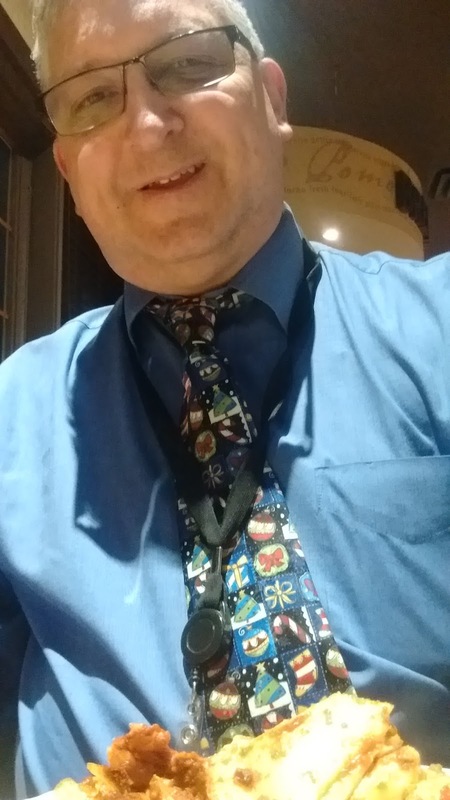 Saturday evening we attended a Wassail concert at the Manning Memorial Chapel at Acadia University. Choral music featuring some songs from medieval times, plus some Christmas tunes you'd find familiar, like "Hark! The Herald Angels Sing", and "Silent Night", which included a stanza in its native German. My, oh, my. We enjoyed that show tremendously. Today, we had breakfast at the Cora's in Clayton Park. We liked the food but did not like the price. $48 would have paid for a lot of breakfast foods at the grocery store. After that, we went to Canadian Tire in Bayer's Lake and got a few things. I got cable ties for the lights I put up in 2018, so I won't have to use twine. We got a Christmas tree as well, but we haven't put it up yet. Maybe Monday night. Tomorrow, we return to work. These damn weekends go by too fast. Patricia has a thing after work the next two nights. I get to be here with Newbie. We will do our nails or something. A day off work. We slept in like we were hibernating or something. Mid-afternoon, we decided to go to Spryfield to get a few groceries and to check out the thrift stores. One place had two, count them, two, of those beloved GE clock radios. One of them has the blue display rather than the red one I am used to on all the other ones I own. They are the best clock radios ever built. Thirty-year-old GE clock radios can still work flawlessly, assuming you haven't dropped them off a cliff or something. I gave one to my dad quite a few years ago, for his workshop. After his death, we executors were going through the workshop to see what we could sell for the estate. We found that radio. I dusted it off and squirted a little WD 40 in the tuning dial, and plugged it in. It has worked beautifully all this time. Anyway, now I have two more of these awesome radios. They sell well on ebay as people covet them. There are a ton of youtube videos on these radios. There are Etsy pages galore about these radios. People revere these radios!! I also got some books. Tomorrow promises to be busy. I think I will turn in. Gee, morose pictures, two days in a row. How much will you pay now? So, there is a Christmas party at work. I seldom carry cash with me any more. I neglected to purchase a ticket for said party. 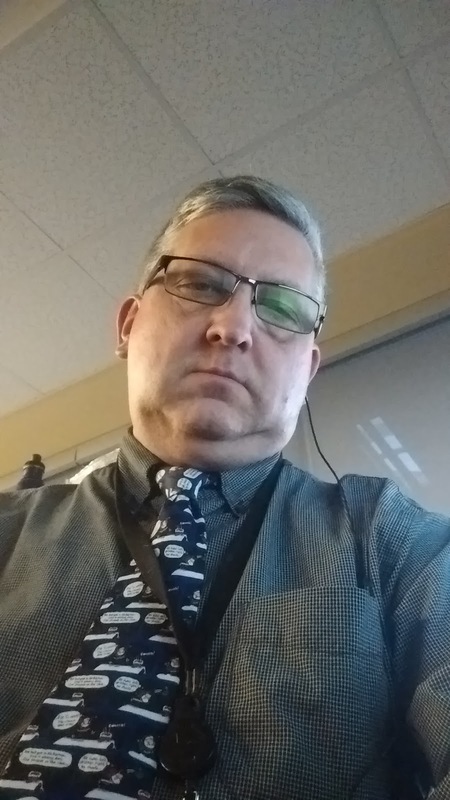 So, while folks are at this party, having a good time, and while Patricia is doing her Pilates class, I am here at work writing a blog post and killing time until I can go pick her up. I will try to be happier when this series resume on Monday. I am off work on Friday, Saturday, Sunday. See you tomorrow, with something else. This one is a little sad. I am standing in front of my Toastmasters club's banner. Tonight was the final night that we will meet at our regular meeting place. The club is homeless. If we do not find a meeting place soon, the club will have to fold, during its 50th year. I joined TM back in 1991. There were two clubs that met in the same meeting place. In 1998, we joined the two clubs into one. And, over the years, the membership dwindled to the point where we were down to just a few members. 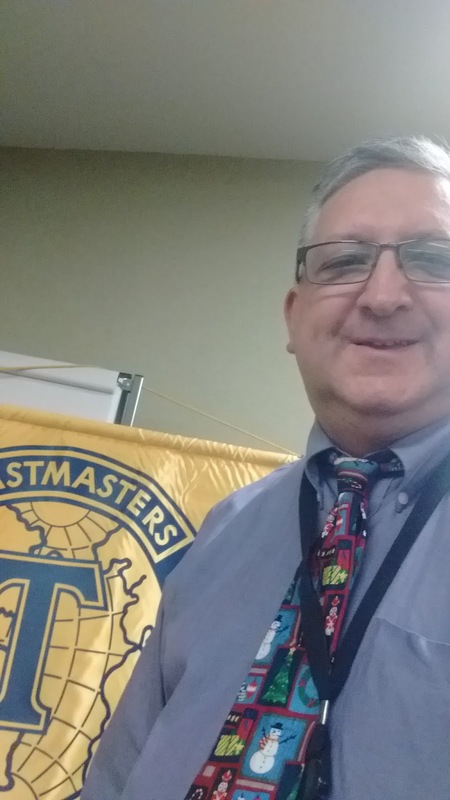 The member who has been hosting our club since 2007 can no longer do so, and we have no place to move to. I hope that is not the case. I hope we can persevere. 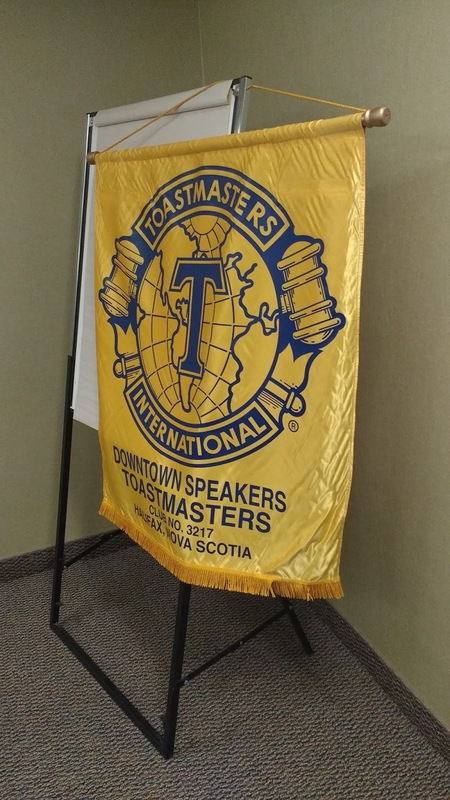 But in case we cannot, the club lectern, the banner, and a few other things are now in my possession. My father built this lectern for us back in 2000, and I will not see it go to a landfill or anything like that. I have devoted nearly half of my life to this club. I would hate to see it fold. On the other hand, nothing lasts forever. We have some tips that may lead to us having a new meeting space in 2018. We will keep our fingers crossed. If you have any suggestions for a free, or very cheap, meeting space, let me know. Taken in the upstairs bathroom before I got nekkid and took a shower. Patricia says I wear that Dell baseball hat too much. That's why I took off the hat for the last couple of pics. I think I will have two blog posts on Wednesday. My goodness, how much will you pay now? And here we are, at day two already. Where has the time gone? 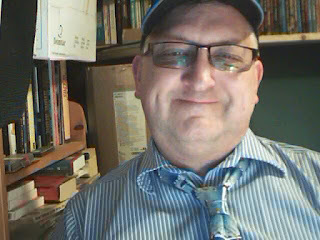 Tonight's pics are courtesy of my webcam. I am home working on my next Frank Magazine article, whose deadline is two days from now. 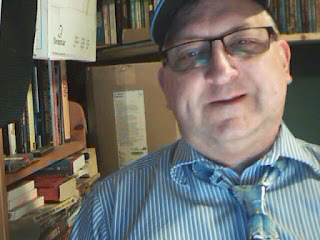 I wonder if any of you can make out the titles of the books that are behind me? As soon as the dust settles I will post more covers from books in my collection. You guys seem to get a kick out of seeing these covers, as well as reading my thoughts about them. You guys are weird. Gotta get back to work. Talk at ya later. Late Sunday night. Spent the last 90 minutes or so transcribing part of a phone interview I did recently. Lots of good information there. We had lots of grandiose plans for the weekend, but did nearly nothing. I did set up the Christmas lights I ordered online the other week. They are solar-powered and look pretty good for the cost and the fact that they do not run on electricity. They charge for just a few hours, and remain on all night. Amazing. I am going to order another couple of sets of them, possibly before I turn in this evening. We did watch some stuff on the pvr. We are caught up with Lucifer, and started watching season two of "Good Behavior". And Sunday morning I watched the four part Arrowverse "Crisis on Earth-X" crossover. DC can't put out a decent movie to save its life, but the DC tv shows are all watchable at the very least. A four day work week awaits me. Four more Christmas ties for you to enjoy. Are you not looking forward to it? Guess I'll turn. Right after I order some Christmas lights. Welcome to the ... tenth year for Bevboy's Christmas Tie Extravaganza! When I started doing this in 2008, I had no idea that this would catch on. I had no idea that people would start asking me in August if I was going to do this again this year. I don't get it, but here you go. 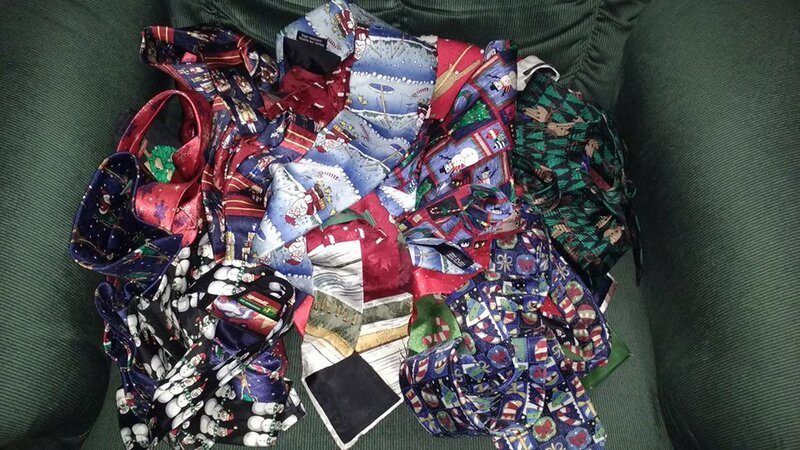 First of all, here are the ties I have to work with. I chose to put this one on today. And, you know what? 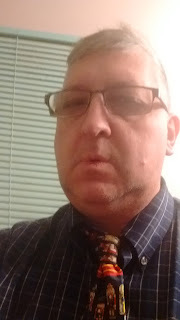 Hardly anybody noticed I wore a tie. On a Friday. Let me repeat this: a non-management civil servant wore a tie on a Friday, and nobody noticed. The weekend is here. 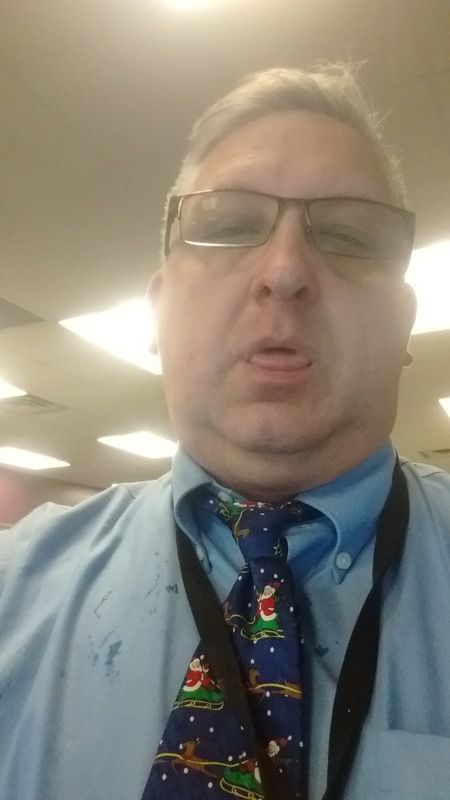 No more Christmas ties until Monday. That's the way it work. My Toastmasters meeting was cancelled tonight, so I spent that time at the archives, researching a couple unsolved murders and a missing persons case. Found some good information on one of those cases, and nearly nothing on the other two. It was not a waste of time. People have been asking me why I do not write a Frank article about the higher profile cases, the ones that get all the press. Kimberly McAndrew. Jason McCullough. A few others. The answer is very simple. Those cases have had so much coverage, so much ink, that I fear I cannot add anything to them. I want these cases to have some original research, content you can get nowhere else. At the very least, unearth information that hasn't been reported in a long time. I don't have a clue how I could write something about those well-known cases that hasn't been reported many times before, and relatively recently to boot. My strong preference is to look at the cases that haven't had much coverage for whatever reason over the years. I am not always successful, but when I am, I am proud of how things turn out. The article about Ann Marie Masson, in the issue of Frank that hit stores today, is the longest such article about her and her murder that has ever been done. It's nearly 1500 words. With the pictures, it runs nearly three pages. Most of the other articles run just a few paragraphs and regurgitate the same facts over and over. 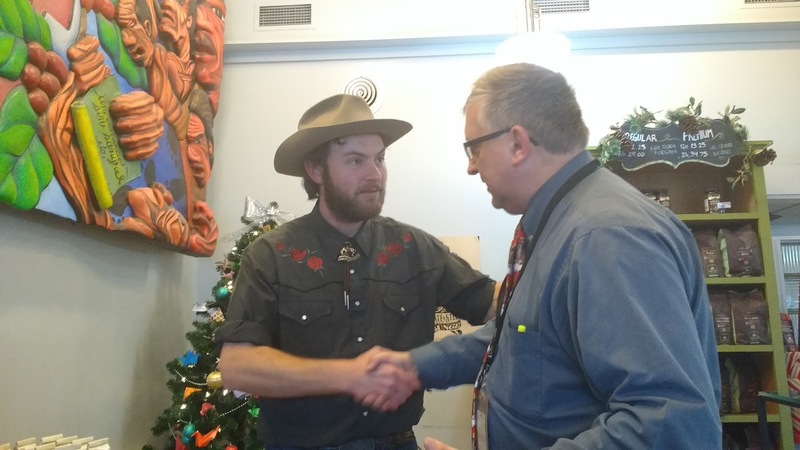 My article about poor Newt Boutilier is about the same length. 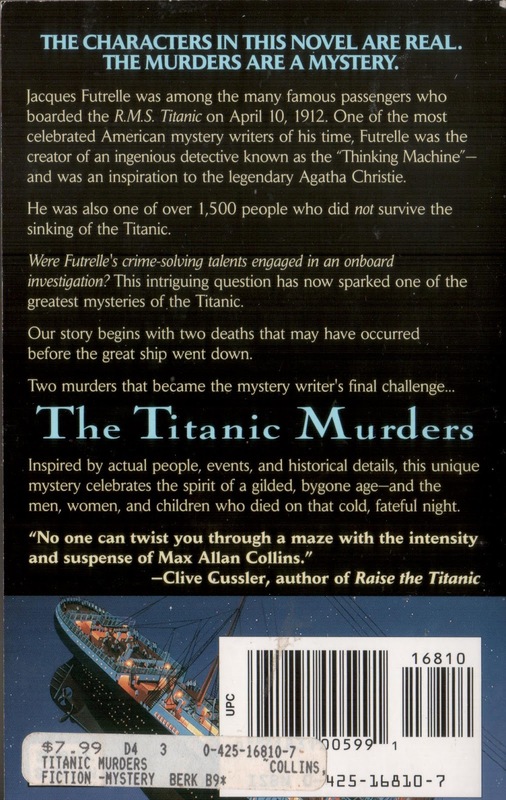 It includes two other murders, both solved, along with information about Newt that had not been reported in decades. Once again, the longest article about him ever published. The article about Lyndon Fuller, more than a year ago, runs four pages. If there is a longer article about him and his disappearance, show it to me. The Ann Marie Masson article contains information you will find nowhere else. I urge you to go out and buy this issue of Frank and you will see what I mean. Another long day at work. Tonight, I cooked dinner. To make room in stand-up freezer, we took a small bag of haddock out. That is what I cooked tonight. There are left overs for another day. Why don't you come over? I have already got some nice feedback on the cold case article in the issue of Frank that hits newsstands on Wednesday. The article is nearly three full pages long, so it is easily the longest article about the life and death of Ann Marie Masson ever done. If I were just a guy, a reader of Frank, these articles would be the first ones I'd read. The fact that I get to write these articles makes it all the more rewarding. Please forego coffee for a couple of days, or make it at home, and use that money to purchase the new issue of Frank. You can thank me later. Another Toastmasters meeting tomorrow. Those meetings come up so frequently. Hello. Did you miss me? I'm sorry I haven't written much lately. I worked really late Thursday night on my latest Frank article. It is about a cold case murder, with many twists and turns. Information was still coming in on Thursday evening. I worked on Friday. Friday night, while Patricia was at her book club meeting, I was dozing off on the living room chair, so I turned in. Saturday morning I was up at 5:30 to drive to the Valley. I had an appointment with a gentleman. He showed up at 9, and left around half an hour later. I ended up staying the night because I was exhausted and didn't think I could drive back. This morning I cleaned out some stuff down there. It will go out in the garbage here in the city on Tuesday morning. Patricia and Newbie greeted me with their usual indifference this afternoon, so that was nice. We have spent a quiet number of hours together in harmony. Which is to say, I slept for quite a spell. Back to work in the morning. Where do these weekends go, anyway? Didn't write Wednesday night. I was toiling toward a hard Frank Magazine deadline, late into the evening. Finished the first part of that deadline during my lunch hour today. Then, some more information came in this evening. But there is no time to think about that, because the second part of the deadline is this evening. Much shorter piece this time, but I think I need a nap before I confront it. I will try to write more on Friday. Sorry to be so circumspect. I cannot find my digital camera here in my house. I need it for a specific purpose. I hate when I can't find something. Does that ever happen to you? You can't find something, and you go looking for it? But you don't find it. Instead, you find things you couldn't find the last time you went looking for them. I wish I could project myself in the future and look for yet another item, not find it, but in so doing unearth my digital camera. I am sure some science fiction writer has written a book of three about this paradox. 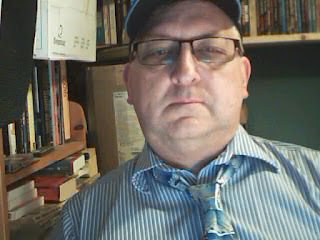 I am charging the batteries for my video camera, the one I bought on Kijiji last year. I haven't used it in over a year, since investigating one of my cold case articles for Frank Magazine. The batteries have sat in the little pouch next to the camera since then, and slowly discharged. In the coming hours, I wil charge them again, and use the camera to shoot some video of the thing I want. Then, I will use an app to play back the video and press the short cut to "slice" off a digital picture or two. Not the best approach, but the only other one is to use the camera app on my phone, which I do not expect to produce the results I want. The tip that Frank Magazine got on Friday morning that Don Connolly would announce his retirement on today's Information Morning, turned out to be right. His last day is... about 10 weeks from now. He said that he had planned to retire in early 2016, but an injury a year earlier derailed that, ironically enough. He was off work for a few months. He wanted to return to work with full vigour and have at least one year where he was able to give it his all. That turned out to be two full years, apparently. Like I said last night, it is not big news when a 70 year old man decides to call it a day. It should be remembered that the previous Don, Don Tremaine, retired from the CBC 30 years ago, when he was about 58. Connolly has hung on a very long time. The question is, who will replace him? A Facebook friend opined it could be Ian Hanomansing from the National. That program is going off the rails with four hosts, him being one of them. I think the CBC is already looking for a way out of that. Offering Ian a good morning show post would be a good move for them, but not a good career move for Ian. He could only see it as a demotion. I think that Louise Renault, Don's current co-host, could easily elevate to the main position. She is terrific at everything she does. I don't know what her knowledge base is on things like politics and so on, but she could get up to speed easily. Otherwise, who? Norma Lee MacLeod, perhaps? She is wasted on Maritime Noon every day. A harder news show would right up her alley. Or, maybe the CBC will look to another market for a successor to Don. I have no idea. But it will be interesting. Man, I have to get that full, unexpurgated Don Connolly interview dusted off and published here. Frank Magazine only ran about 40% of it a couple of years ago. I think I will turn in. Lots to do and think about. Well, we had our tenth anniversary party the other night. I had dearly wanted post 3600 to be also the tenth anniversary post, but that did not work out. This is not really the actual post 3600, anyway. Over the years, on several occasions, I have lost count of the blog post, sometimes adding or subtracting hundreds in the numbering system. Sheer carelessness on my part. At any rate, I hope you had a good day. We both slept in until quite late. This afternoon, I moved our barbecue, and some lawn furniture into Patricia's "she shed" in the back yard. Said she said is now pretty much full up. I cannot imagine getting much more in there, but at least the stuff is out of the back yard and off the deck, which looks barren and cold for the impending Winter. I cooked both breakfast and dinner today. Who says men can't cook? Well, Patricia says I can't, but she eats it anyway. Before I forget t mention it, if you have a mind to, I suggest you listen to Information Morning in mainland Nova Scotia Monday morning between 7:30 and 8. 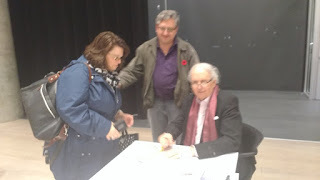 Frank Magazine received a tip on Friday morning that Don Connolly will announce his retirement then. Anytime a 70 year old man calls it a day it is not news, but plenty of people will miss listening to Connolly in the morning. I am not counting on this announcement to happen. Frank is skeptical, for example. I am, too. But I will be listening. I think I will turn in. Long day tomorrow. I went to the Archives today. Spent several hours looking for information about a particularly difficult missing persons case and found nada. Then, I looked into a pretty old unsolved murder case and found quite a bit I felt good when I left around 3pm. 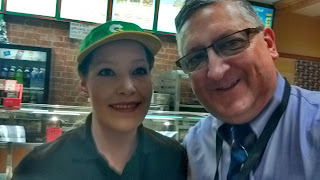 On Friday we had gone to Gateway Meat Market in Dartmouth. Among other things, they had a sale on haddock, which is our fave fish ever. It is a food group to us. Stored it in a costco bag over night in the car, as it was cold enough. I brought the bag in before heading out this morning. When I got home, I cooked some of it for dinner. This evening, I used the machine we have to compress the remaining packages of fish in place so it can freeze without incurring freezer burn. Ditto for some chicken. We watched some tv this evening. And I have been down here in my home office upgrading my dropbox account. I now have 1TB of storage, which is easily 10x more than I will ever need, but it is the smallest package they sell. Once I had done that I uploaded some stuff to it. I use Dropbox a lot. 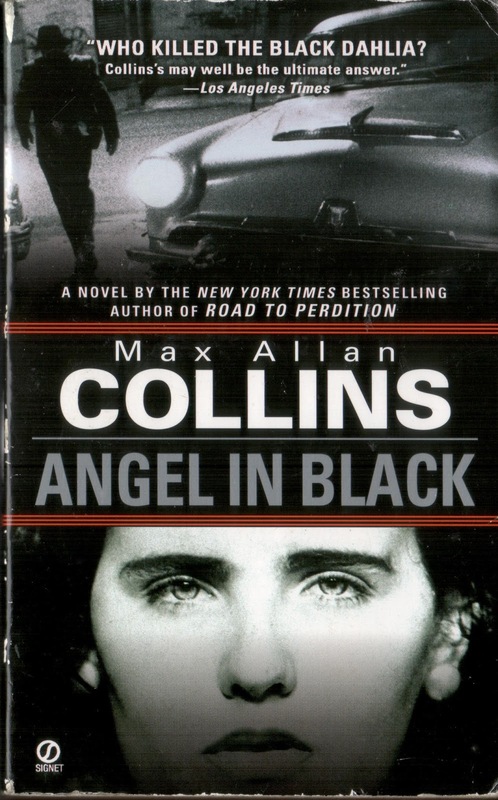 Got a nice quick email from Max Allan Collins this evening. He was pleased to learn that I write about unsolved murders and missing person cases, and that my interest in crime fiction is what sparked this interest in true crime. He will link my blog post from the other to his own blog this coming Tuesday. I will likely get hundreds of extra hits on that blog post in the coming days. I promise I will not forget the little people who put me here. I have worked hard the last couple of days. I think Sunday I will do very little. I need a day off. First of all, read this. Yep. That was the first blog post, which was ten years ago to the day. I had very much hoped that post #3600 would be tonight's post, but I wasn't feeling well enough today to write throughout the day. We ran the roads and that tuckered me out. Slept much of the evening away. Post 3600 will be here in good time. So, anyway, the tenth anniversary. I started this blog after I felt unwelcome on a message board run by a man named Tony Isabella. He all-but accused me of exulting in the death of another man who had died suddenly. This man died of the very thing that nearly killed my father in 2000, so what Tony wrote cut me to the quick and made me realize that I did not want to hang out there any more. And, yet, I felt a need to express myself. 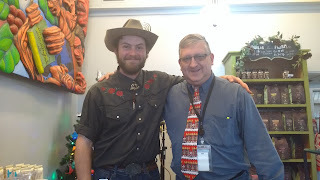 I decided that, since everybody else had a blog, I might as well have one, too. 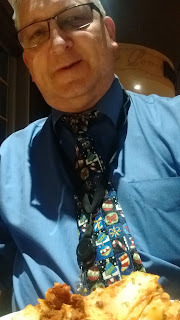 Since people have been calling me "Bevboy" since 1988, to distinguish me a woman in my office also named Bev, and since I like alliteration, I decided to call it Bevboy's Blog. Originally, I was using the actual digitized photograph of myself when I was 11 years old. 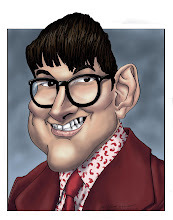 By 2009, I had hired a caricaturist to take the photo and produce the current Bevboy image, the one that is on this blog, my Facebook, and on the thousands of Bevboy's Blog business cards I have on hand and which I have handed out to folks over the years. It remains the case that I will mail a fistful of these business cards to anybody, anywhere in the world, if they but ask me to do so. No charge. Write me here, tell me who you are, and what your address is. You will get Bevboy's Blog business cards toot sweet. The blog began slowly. I was trying to find my way. 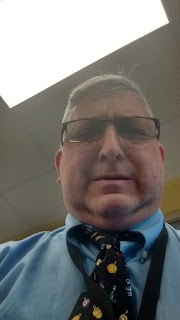 I was trying to understand what to make this blog about. I wanted it to be a blog of general commentary about my life and the things that happened to me while I lived it. The question was, could I do it? The nagging self doubt would not go away. I had interests in radio and have written many blog posts about what was happening in the local radio scene. For years I would interview local radio folks and run those interviews here. 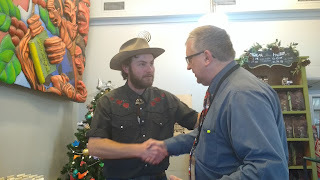 I eventually caught the eye of the editor of Frank Magazine, who hired me to write a column about the local media scene. Being hired to write stuff in exchange for actual money was something I didn't dare dream could happen, but because of this blog, it did. And, now, I write about unsolved murders and missing persons for Frank, and it is some of the most rewarding work I have done. I have written about my fear of metaphors. Those things scare me to death. I don't like them. They lie and cheat and steal, and I wish they did not exist. Similes, on the other hand, are an underutilized narrative device, and I wholeheartedly endorse their use. I have questioned for years the logic behind "women and children first", and wrote about it here, which I know ticked some people off who don't like such fundamental questions being asked. I don't care. I believe that fundamental questions need to be asked about any subject. Just because something has always been done a certain way, doesn't mean you have to keep doing it that way. The blog has been good to me over the years. I have written about the deaths of my parents. They helped me get through a bad time in my life. I did the "year in review" series, where I would write about a given year in my life in as much detail as I could recall. People still tell me how much they liked it. I have worked hard, day in, day out, over the last ten years to produce the best work I can for you. That 4.7 of you read it every day, makes me feel good. I don't know if blogs will still be a thing in 2027. I don't know if I will still be a thing in 2027. I just know that I still have things I want to say, and this is the place to do it. I hope you will come along for the ride. It gets a little lonely up here, on my soapbox, talking to myself. Yeah. I know. It's late. Feel terrible. Went to bed very early. 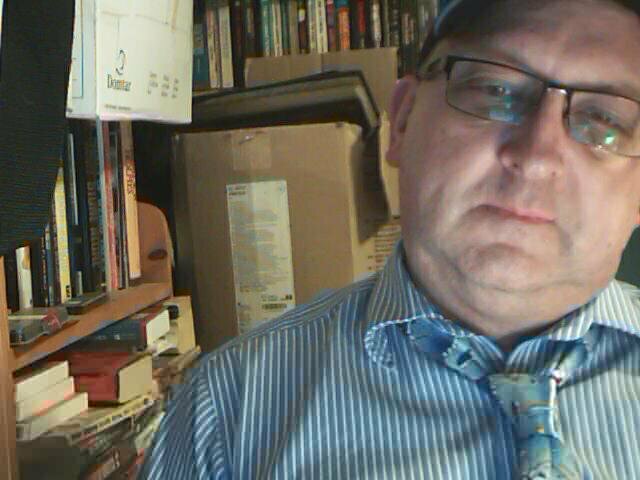 And, a few minutes ago, about 3:30, I was physically ill. I am not sure what brought this about, but I don't think I will be going very far on Friday. Special blog announcement on Friday if I am up for it. Hmm? What's that? You want me to write about more books I own and like? Okay. I think it's a little weird, but here you go. I have been reading, collecting, and enjoying the work of Max Allan Collins for over 30 years. I first heard of him in the pages of Ms. Tree, a comic that he co-created and wrote in the early 1980's. I soon learned that he wrote crime and detective novels, so I started seeking them out. 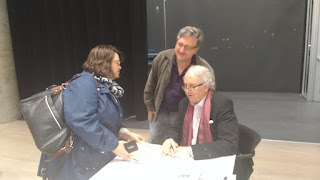 I now have dozens of his books, probably about two thirds of his works. He has probably made enough in royalties from my purchasing his books to take his wife out to dinner at a nice restaurant. These are some of my faves, although one of them I haven't actually read. There are only so many hours in the day. "No Cure For Death" features MAC's character Mallory, a writer in Iowa who solves mysteries on the side. He has stated more than once that he finds Mallory boring, and abandoned the character some 30 years ago. I disagree with Collins on this opinion. 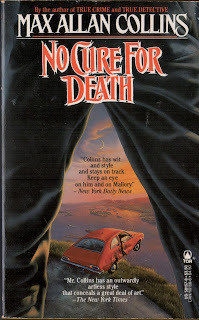 I can tell you that "No Cure For Death" is one of my favorite novels of the 1980's. I read it in the summer of 1987 when I was living and working in Sydney, Cape Breton. The final paragraph on the last page made me smile, and still does. It was a perfect ending to what I thought was a nearly perfect book. 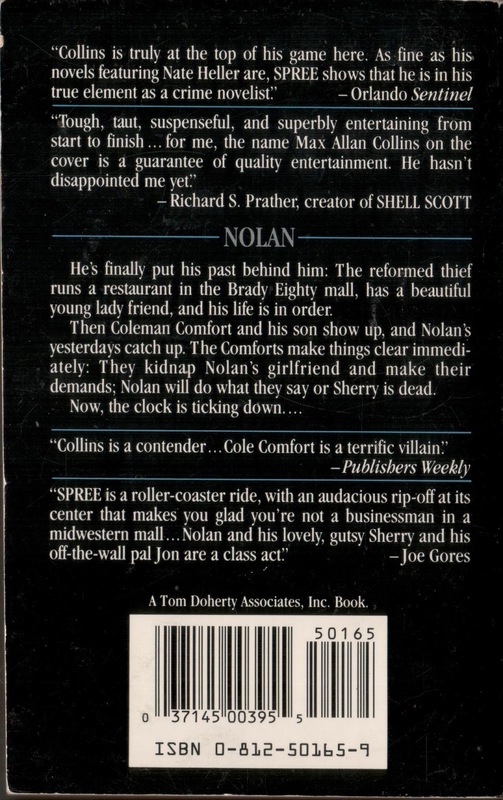 The Nathan Heller series is likely MAC's best known, after the Road to Perdition series. 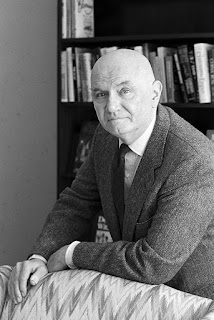 Heller is a private detective whose career spans many historical moments in American history. Collins and his researcher learn everything they can about a particular time and a particular case, and insert Heller into that storyline, extrapolating and speculating on the solution to that unsolved murder or missing persons case. 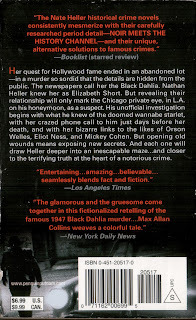 The one from above tries to solve the murder of Elizabeth Short, best known as the Black Dahlia. Another looks into the disappearance of Amelia Earhart. James Ellroy also wrote a Black Dahlia novel quite a few years ago. It is nearly incomprehensible, and it begat a nearly incomprehensible movie directed by Brian De Palma. He should have based the film on MAC's novel! I love the Quarry series. Quarry is a former marine sniper who becomes a professional hitman following his return from the Vietnam war. 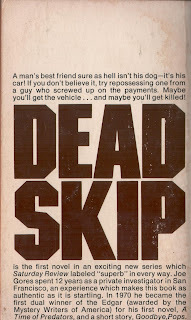 MAC retired the character several years ago but continues to write Quarry novels that take place during earlier parts of the character's career. There was a "Quarry" tv show in 2016, which you should check out. 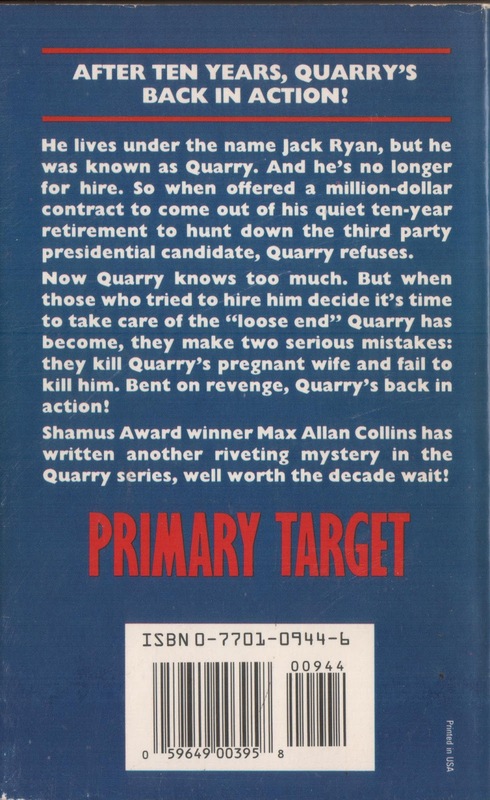 To make it easier for readers, the current Quarry novels all have "Quarry" in the title. 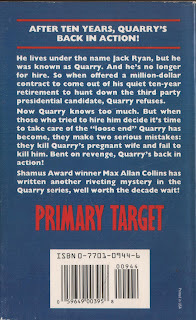 "Primary Target", published in 1988, was retitled "Quarry's Vote" several years ago, as were the earlier Quarry novels. Quarry's been retired for a decade as our tale begins, until circumstances force him to jump back into action. I read this book when I first saw it, in 1988. I still remember snatches of dialogue! 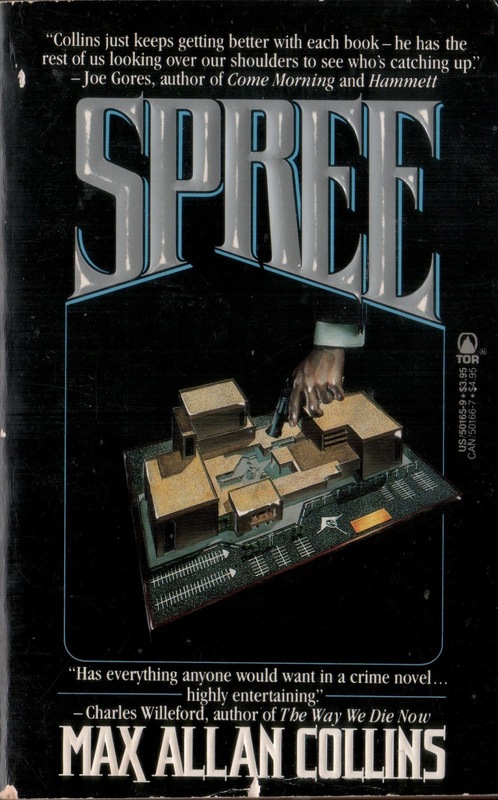 "Spree" I also read in 1988. I recall reading chapters of it on the Dartmouth-to-Halifax-back-to-Dartmouth ferry going to and from work during a period when we had to work a bunch of (unpaid) overtime. It is a continuation of the "Nolan" series. Nolan is a professional thief, getting on a bit, who wants to do "just one last job" and retire. Each last job ends up leading to another one. 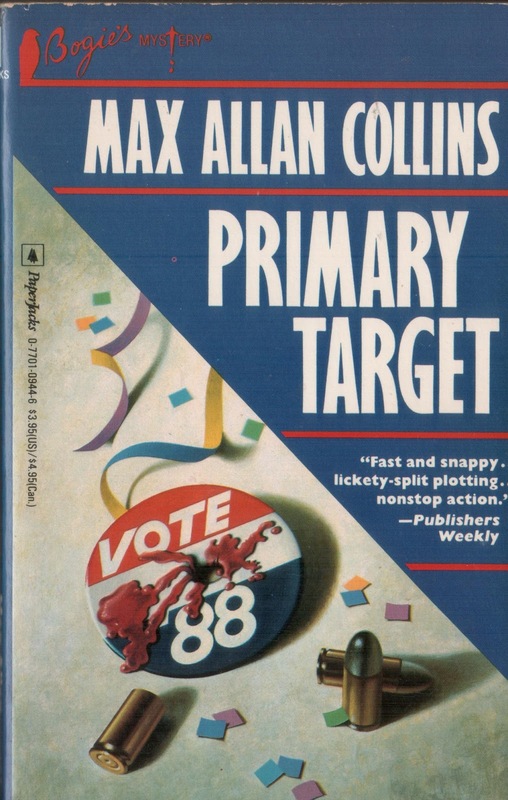 Once again, Collins abandoned this character, after this novel. Once again, I think this was a mistake. People call this "The Disaster Series". 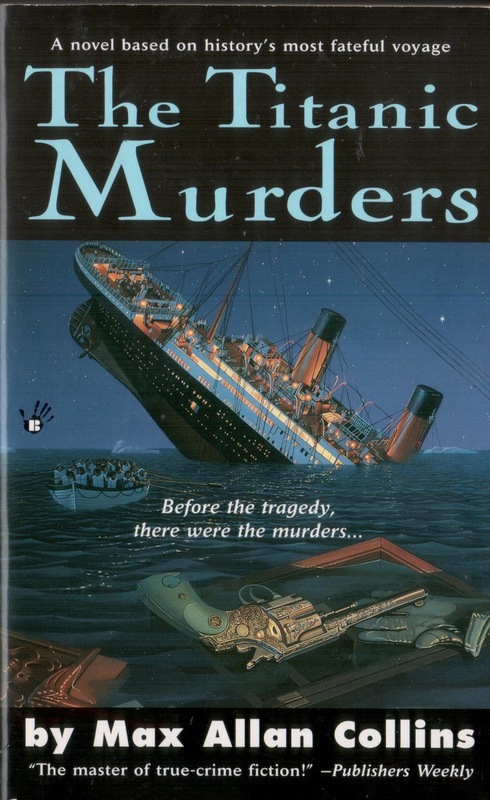 Collins used various disasters like the above, or Pearl Harbour, or the London Blitz, as a backdrop for real-life people to solve fictional murders or mysteries. 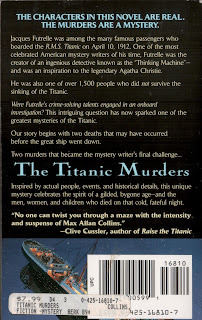 "The Titanic Murders" features mystery writer Jacques Futrelle, the creator of the Thinking Machine character, who solves a couple of murders before the Titanic sinks. Futrelle died on the Titanic and is all-but-forgotten today. "The Problem of Cell 13" should be required reading for anyone who likes to read a good puzzle story. By the way, Futrelle was not French. He was a Southern gentleman. I can only speculate that he had some Cajun roots in him, which led to his name. So, there you have it. A very few of the Max Allan Collins novels I have. I adore this man's writing and wish more people would sample it. 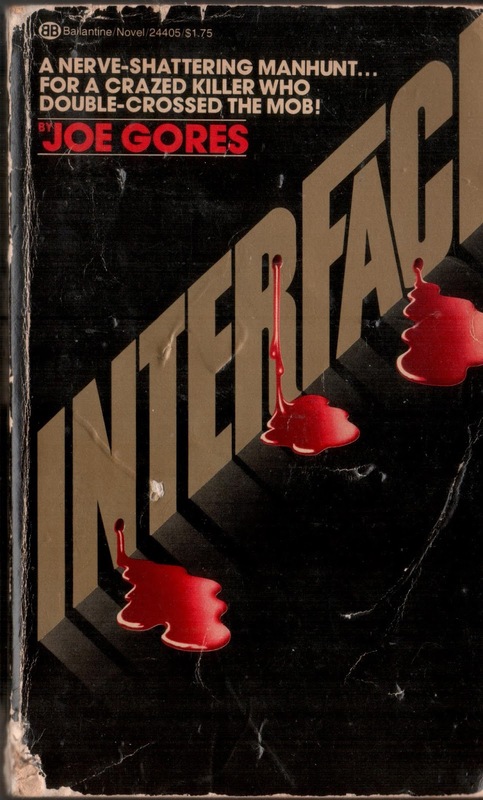 All too often, people turn their noses up at mystery fiction, not realizing how rich and vital and fascinating a genre it is. It has held me in thrall for most of my life. My interest in it has made researching and writing Nova Scotia-based unsolved murders and missing persons cases all the more rewarding. So, what are you waiting for? Start reading! Dozens of you wrote me. #BevboyDiscussesVintageBooks is trending on twitter. Plenty o' private Facebook messages hit me. You want me to discuss a few more vintage books. I had to read this book in university. It was a course about fantasy and Arthurian legend. The professor's interest in King Arthur bordered on the fetishistic. The first thing we had to read, though, was The Lord of the Rings trilogy. My.God. To this day, I cannot remember being more bored by anything I have put in front of my eyeballs. People find the series engrossing, enchanting, whatever. To me, it was monotonous to the extreme. In order to keep up, which I barely did, I had to buy another book that told me who all the characters were, and what their motivations were, and so on. I would have failed the course otherwise. My experience with "LotR" was so negative, that it has been impossible for me to even try to read another fantasy series. People go on about Game of Thrones. Haven't cracked them open. Robert Jordan's "Wheel of Time" series is in... what? 13 huge volumes. Jordan died before he could finish it. Can't read them. Haven't tried. Scared of the overwhelming ennui that awaits me. I may be wrong. I might love those series. But that damn "LotR" series I had to read in 1986 was nearly the death of me. 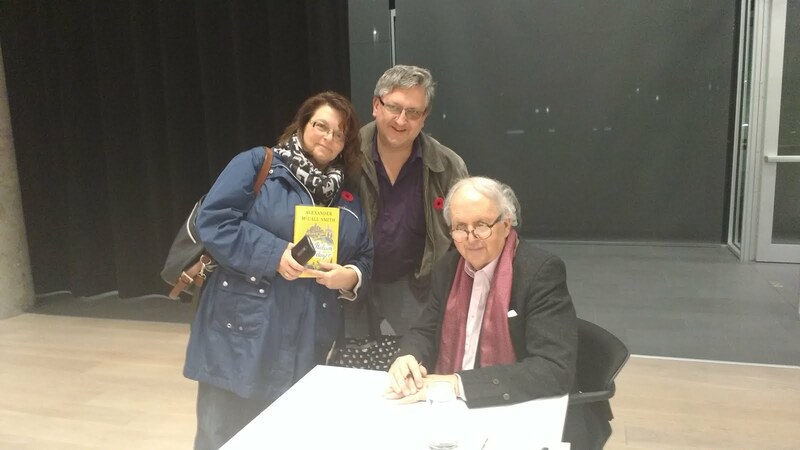 I told the professor how much I despised that series when I ran into him at a science fiction convention back in 1986. He acknowledged that the series is not for everyone. There were some positive aspects to that class. In addition to the man who would go on to become a judge of the Nova Scotia Supreme Court, I also remember the pretty girl who sat behind me in class. She borrowed my notes once and called me at the house to help her interpret my hieroglyphics. Talked to me before class. When I put myself down one day, she launched to my defense, which was nice, because that made one person in a row who ever did that. Probably stared at the back of my neck and sent me love thoughts during class. I never noticed her until the day of the final exam when she sat in the row ahead of me, to my left and wished me luck on my exam. It finally dawned on me that she might be interested in me in at least the way a dog is interested in a table scrap, but I had another exam directly after that one and couldn't hang around afterward to follow up. I have never seen her since. And I don't know her name. Anyway, this series is about books. Let's talk about some. So, I hated Lord of the Rings. Still do. When the first movie came out, Patricia wanted to see it. I took her. I so expected to be bored, falling asleep, that I was surprised when I was able to stay awake. I believe we saw the next two movies in theaters, too. I tolerated them. The professor then made us read several King Arthur-related novels. "The Sword in the Stone". "The Dark is Rising". Uh, "Kingdom of Summer". Maybe one other book, and then "Arthur Rex" by Thomas Berger. I still have the actual paperback I read back in 1986, around here someplace. I loved the book. Loved it. Laugh-out-loud funny. Screamingly funny. Like, I had to put the book down at my desk at home so I could control myself. Before class, while Ms. I-Don't-Know-Her-Name was eyeballing me, I'd talk with the guys about the chapters we had just read. We were all laughing while trying to discuss the book. The women in the class, however, found the book less funny. They found the story sexist. They thought that Berger was a cruel-looking, ugly man who hated women because his characters appeared to be misogynistic. We guys didn't see it that way at all. This book remains the funniest novel I have read in my life. After the class was over, I went back to the university bookstore and bought as many of the remaining copies of the book I could afford and mailed them to friends, likely none of whom read it. 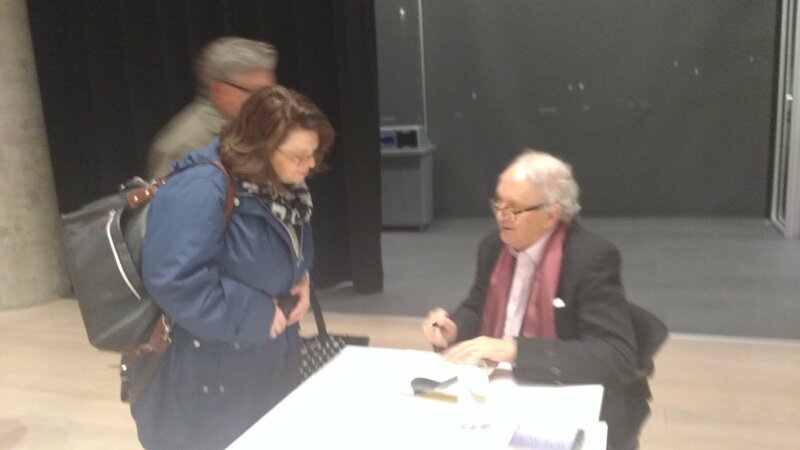 I ran into the professor that year and thanked him for including the book in his class. 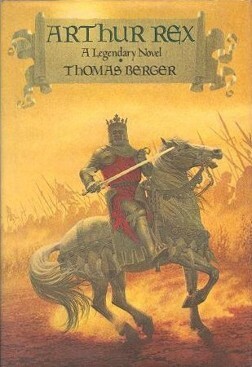 Thomas Berger's "Arthur Rex", as I mentioned, remains on my bookshelf. 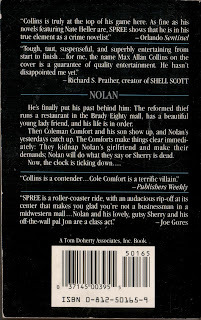 In 1993 I acquired a first edition hardcover of the novel, which is on the bookcase next to me. I love this book, and challenge all of you to go out there and read it. Just don't ignore the pretty girl in the row behind you, okay? I like these days. Just sitting around not doing much. Watched some television .Washed the dishes. Patricia made a wonderful chicken dinner with roasted Brussels sprouts, that I enjoyed more than the chicken. The chicken was awesome, of course. We brought back a lot of food from the cottage yesterday. Stuff from the freezer, mostly. Several packages of chicken (some of it cooked today), some hamburger, more than a few packages of sausages we got for half price at Sobeys this Summer, some coffee, some other stuff. When we got back around 6:45 last night, I had lots of fun finding room for it all in the freezers. We now have enough food to last us for several months, as long as we are organized and take stuff out ahead of time to thaw so we can cook it. I also grabbed a few books I was keeping at the cottage, and brought them back here. All my Michael Connelly Harry Bosch novels are under one roof now. I know you don't care, but I care, because I care about such things. You have to accept my quirks, people. We have been together for 10 years now! It will go so much easier for you if you just go along for the ride. Last week, I went through my disorganized book collection and found what I think are all the other Connelly books in my collection. In doing so, I found quite a few other books I had misplaced. 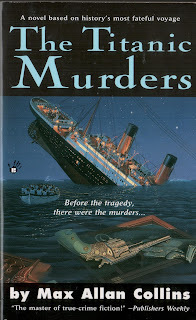 A particular favourite are the stories of Mr. Joe Gores, whose work I became familiar with in the pages of Ellery Queen's Mystery Magazine, and which I enjoyed very much. I soon learned that the man wrote novels, many of them featuring the repo-team of DKA, or Dan Kearney and Associates. Gores himself had spent many years working as a private investigator specializing in repo's. It was the San Francisco firm of David Kikkert & Associates, which he thinly disguised for his eventual series of novels and short stories. It may sound boring, but these stories were anything but. Here are a couple vintage covers from these vintage novels. Okay. About the cover of "Dead Skip". You have to realize the time. It was published in 1972. Plenty of pictures of scantily-clad young women were used to sell books back then. I'm not saying it was right, but that it happened. And I don't think that the guy who wrote the cover copy meant that deadbeats who don't pay their bills are slept with. "Shagging" clearly had a different meaning in 1972 than it does now. I gather it has something to do with the sneaking around that's necessary to be successful in repossessing people's things when they don't keep the payments up. 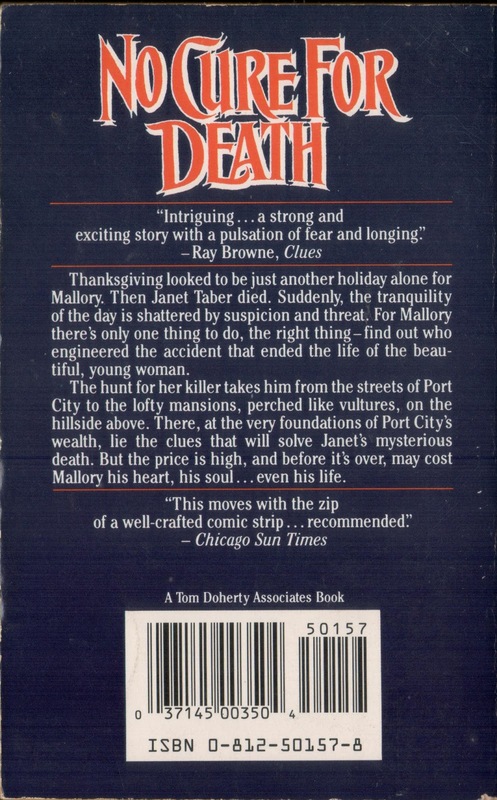 Damn, I loved those DKA short stories in Ellery Queen's Mystery Magazine when I read them as a youngster. I am sure they are still over there in the bookshelves I have set aside for EQMM. 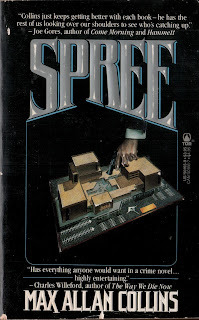 I was elated to learn that Joe Gores had written actual DKA novels. And in these days of bloated, overwritten novels that could be twice as good if half as long, these novels were only a couple hundred pages, or less. 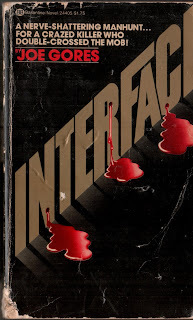 If you like, I can scan in covers from some of my other vintage books in my collection. Let me know. This was fun. I have even started a "VintageBooks" label to help you find them, should you want me to do more. A very long day. A day trip to the cottage and back, with time in between devoted to removing the battery from the lawn tractor, emptying out the freezer and fridge, a lovely dinner at Sharon's Place, and then a return home. We are both very tired. The blog turns 10 on... November 17th I think it is. My goodness. How will we celebrate? 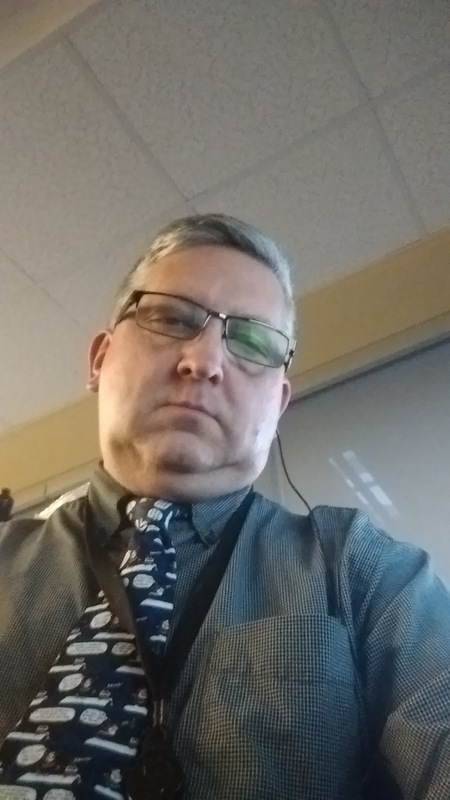 A very long work week. And what is our reward? Well, a day trip to the cottage on Saturday to shut the place down for the Winter. We may elect to stay over night, but then again, we may decide to come back tomorrow night. Depends. After work this evening we decided to have some fun, so we went to the Casino for the buffet dinner. It was pretty good. The salmon was much better than we expected it to be. The carvery beef was delicious. The mussels tasted like more. The chicken in gravy was to die for. Only the bread pudding was disappointing. We later learned that the man who had made bread pudding as part of his job for 30 years, retired recently. The people who picked up the mantle have, well, a bit of room for improvement. We waddled out of there and played the slots for a few minutes. I had a five dollar bill in my pocket, and that is exactly how much I gambled with. When it was gone, I stopped playing. Patricia wanted to play a second five dollar bill, but the machine would not accept it. So, we validated our parking and left. We went to the Chapter's in Bayer's Lake to look around. I bought the current issue of Isaac Asimov's Science Fiction Magazine. I used to have a lot of back issues of "IASFM" but gave nearly all of them away a couple of years ago, even the early ones edited by George Scithers, which may have been a mistake. I got the one tonight because it was the 40th anniversary issue. 40 years. I remember reading ads for the magazine's first issue when I was a much, much younger Bevboy. I adored Asimov's writing back in the day, even the stuff that should have made me wince. In light of the recent news about Louis C.K., Charlie Sheen, Kevin Spacey, and all the others, people writing about their boorish behavior 30+ years ago should have made me take notice, but usually didn't. Asimov, revered as a science fiction icon, and who died in 1992, also wrote quite a few mystery stories, of the puzzle variety. Someone would die, or have something stolen, and some smart arse character Asimov had created would solve the crime and make us feel stupid for not having figured it out ourselves. He was revered, but in recent years, there have been persistent stories of his behaviour toward women, pinching bottoms, groping, that sort of thing. He would also admit to some of that crap in his writings. "I dropped off the latest Black Widower short story to the EQMM offices and chased [editor] Eleanor Sullivan around the desk", was something he wrote about with no trace of shame or guilt. The tone was jaunty if anything. Other writers have done some things they shouldn't have. I am still not sure if the time writer Harlan Ellison groped writer Connie Willis' breast at a science fiction convention was his idea of schtick, or what it was, but Willis didn't like it very much at all. Her latest novella is in the issue of IASFM that I bought this evening, by the way. There are so many more examples, most of which I don't know about, and will serve as a surprise if and when they do. 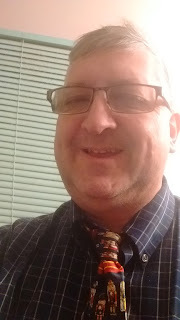 I also know of some things that have happened in government over the years that should not have happened, like the time a woman was informed by a male manager that her maternity leave had been "excessive", despite the complications associated with her pregnancy; or the time another woman suffering from severe migraines was reprimanded for taking too much sick time. These things both happened years ago, but those managers would likely be embarrassed if word got out about what they said back then, today. They could not get away with that stuff today. We live in interesting times, don't we? Time for bed. Bevboy seepy. See you tomorrow, or Sunday. Another very long day. Another short post. Worked all day. After work, I went to the Archives for the better part of three hours to research some missing persons stuff. I think I may have made some progress with a very mysterious case. Following these threads through to their conclusion is very time consuming. I will have to go back again next week and continue. The archives are closed this weekend and I can't go any other day, due to my regular job. 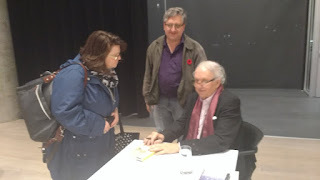 After that was all over, I met up with Patricia at the Halifax library. She had been enthralled by Alexander McCall Smith, the mystery writer best known for writing the No. 1 Ladies' Detective Agency novels. He was in Halifax today. Wolfville, on Thursday. New York on Friday. And frigging Houston, Texas on Saturday. This is a punishing schedule for anybody, let alone an elderly man such as Dr. McCall Smith. We got home around 8:45. I have been down here working on a cold case article for Frank and adding the results of tonight's archives search to my Dropbox. I think I will turn in. Tomorrow promises to be an even more hectic day than today was.